We were hosted in this marvellous villa by a gentle young staff. The villa itself dates from the 1930s and is beautifully decorated with lovely antique furniture. The bedrooms are equipped with AC. The vegetarian dinner we had here tonight was excellent: tasteful vegetables and a delicate sauce. Definitely an oasis to return to! This large, white 1930s pile is the ancestral home of our amiable host Purnima and her husband Ivan Lamech, a charming couple whose English is impeccable and whose hospitality is second to none. Our quiet first-floor room at the rear of this imposing property, named 'Gulmohar' after the flowering trees of that name close by, was clean, comfortable and well-equipped. Its patio with an abundance of potted plants overlooked the Lukerganj Club grounds where local boys practised their batting, bowling and fielding after school each evening. It was a great pleasure to share Purnima and Ivan's home, which we found convenient for all we'd come to see - and reasonably priced too: (January 2018) Rs.3600 (�40/US$55) for the room per night including breakfast and with excellent, freshly-prepared vegetarian meals just an extra Rs.350 (�4/US$5.50) each. When I return to Allahabad, I'd stay here again without hesitation. On my recent visit to Allahabad, I was lucky to get to stay in the Green Room at Kanchan Villa. Given the lack of good quality hotels in Allahabad, discovering Kanchan Villa was a godsend. I was very happy with my earlier stay some time ago and am glad that I stayed here again. Very friendly and warm hosts, well maintained rooms, delicious home-cooked food (much welcome for a weary traveler eating oily restaurant food while on the move) with a pre-dinner drink to relax. I also had a great time with Ivan playing his guitar and singing for the guests with Purnima chipping in now and then. In the words of Arnold Scwarzenegger : "I'll be back!" My stay at Kanchan Villa was one of the highlights of my trip to Bengal. The rickshaw guy had a problem locating it; you should tell them it is Lukerganj Park Rd. From the moment I arrived Ivan & Purmina could not have been more welcoming despite Ivan having to go to Chennai to see his ailing mother the next day. After a hearty breakfast they arranged a rickshaw to take me around the sights. It was an auspicious dipping day so Sangram was rammed and we skipped on to the Amand Bahvan where the Nehrus and Ghandi planned for Independence. The High Courts of Justice are an imposing sight however it was the 3 mausoleums in Khusro Bagh that stole my heart. That evening I learned a lot about Indian culture from Purmina as we enjoyed some great Bengali cooking. Kanchan Villa is a lovely place to stay with spacious rooms and a warm welcome. All my worries about finding a place to stay in Allahabad, during my visit there with my four year old daughter were put to rest at Kanchan Villa. We felt so at home and comfortable in the warm,cozy and beautifully furnished rooms that we sometimes never felt the need to step out into the city! The home stay has all the amenities required that was provided seamlessly- hot running water, television, laundry,wi-fi, even toys, and books to read,and best of all the food cooked with much love.I would say the heart and soul of the home stay is the hospitality of our hosts who made our homestay experience memorable and unique.The tips and suggestions on what to see and experience in the historical city of Allahabad by our hosts also made our visit to the city life-changing. If one has to look for a home away from home.....there is no better destination in Allahabad than Kanchan Villa. Having recently returned from Australia, I have had the immense pleasure of now 'chilling out' with the most extraordinary hosts in a world of graceful charm and comfort. My stay at Kanchan Villa will be an experience worth revisiting again and again . Thank you Ivan and Poornima Lamech !!! Kanchan villa . The name says many things .This is a different concept for India . Having stayed lot of different star rated hotels and traveling for past few months . This was the place I needed . Home stay . Wonderful host .Wonderful villa. Nicely maintained home. Old English style house . The best part is the personal touch by the host . If you are a traveller and are tired of Hotel stay and food . This is the place to be. Will be going there for sure . Loved the place . I'm not a big hotel fan, so I prefer to stay in a smaller, intimate place. Accommodation in Kanchan Villa allows you to get to know the original life in India. The hospitality of hosts is extraordinary. My train has been delayed for more than 12 hours and the owner has met me at the station at 2am. This accommodation also offers the food I really enjoyed. If I went back to Alahabad again, I would definitely choose Kanchan Villa again. High Recommendation. We enjoyed the two nights we spent at this very individual homestay. Ivan and Purnima are lively and interesting hosts and speak flawless English, so there are plenty of opportunities for conversation. We gained many insights into everyday life in India. Our room was large and comfortable (although the bed was a little hard) and the bathroom was spotless. Meals are home cooked and eaten with Ivan, Purnima and other guests. They are are also excellent at organising transport for sightseeing etc. Nothing is too much trouble and the cost of accommodation is more than fair. The previous reviewer is correct however - this is their home, not a hotel, and that needs to be respected. It is a homestay. So you are treated like a guest in a private home rather than a client in a hotel. The hosts are a very welcoming couple and we felt right at home. Since it is a homestay, if you are going to arrive on time for a meal, please let them know in advance. 1) The food is excellent. It is home cooked food. It cannot get any better. 2) They helped us book local sightseeing and arrange for vehicle to drop us at the next destination. They don't take the usual "hotel-cut" and hence we got the best rates. 3) We got the Bengal Room and it and its attached bathroom were clean and spacious. 4) We had an early check-out and the hosts were quite happy to accommodate our request. 5) The wifi connectivity and speed were good. 1) The location is not great if you are here for sightseeing. Only Khusrau Bagh is close by. Everything else is bit of a long haul. But the hosts do arrange for a e-rickshaw at short notices. If you are coming from outside, please use Google maps to find your way. This is in a residential area and the usual "ask the people on the street corner" will not get you here easily. Me and my family had a fantastic stay over this summer. The hosts were lovely and fun to be with. Their hospitality was beyond our expectations. The property was charming and the rooms were beautiful. Our stay at Kanchan Villa was more than satisfactory. The villa is surrounded by greenery and the laburnam was in full bloom. We woke up to the twittering of birds and the cooing of the morning dove. Our accommodation was good. Our hosts; Pixie and Ivan made the entire stay a memory to be stored. These people are our friends... Doust! Three of us came from Australia. This is my friends second time being here. We had a blast. Lots of lots of fun. Cheers guys. Lovely, restful home atmosphere with great food. Hosts are fabulous and generous. Personal care and home comfort available. Good for one or two days stay. Away from main city. I came to stay one night in Kanchan Villa but I ended staying 3 days, as i wasn't feeling well. Ivan, the charming owner and his wonderful wife took me to their family doctor, together with whom we reached the conlusion that I have been food poisoned in Varanasi, one day ago. After one day of medicines I was good to go. So I went on my way. And now I'm missing Ivan wonderfully singing "Countryroads" on his guitar in the evenings, the lovely conversations we all had in the dining room and the peaceful vibe of their house. A little difficult to locate, but worth the effort! This charming home and delightful hosts added something special to my 3 days in Allahabad! A roaring fire in the living room warmed a chilly night, a comfortable bed and good shower added to my pleasure. Just a fine, comfortable home with a wonderful welcome! Both husband and wife were great host . They made us feel like Part of family. Really like the concept of having breakfast and dinner all together. Value for money. We arrived late in Allahabad, near midnight. As there was a local election taking place, all the hotels were fully booked. As fate would have it, we looked up guesthouses/homestays and found Kanchan Villa, and in less than 30 minutes, we were no longer homeless on the streets of Allahabad. Hosts Ivan & Purnima will make you feel part of the family. Thank you so much for taking care of all 10 of us! Great food, great accommodation, great hospitality, great people. old world charm, tastefully decorated rooms ,comfortable, neat and clean and most important ,warm helpful and friendly hosts that have a solution for all your needs. A tranquil home in the midst of the chaos and the hustle of the city. We friends went for a school reunion in November last year and had the best time of our lives!! There were 12 of us.. we wanted to stay together ... at a comfortable , reasonably priced , centrally located place . Somebody suggested Kanchan villa and we decided to book ourselves in. The rooms I MUST say are each.. beautifully appointed, neat and clean ( including the bathrooms) the surroundings lush green and artistically done!! The host and hostess ... Ivan and Poornima... very warm and hospitable people .. who kept us entertained too ... with their love for music and interesting conversations !! To top it all ... they had taxis arranged for easy pick up/ drop to the station and airport, and for our local movement too... including sightseeing. The breakfast ( being a bed n breakfast deal) was tasty and well thought out.. keeping our tastes in mind!! Would LOVE to go back again and spend quality time with Ivan and poornima ... thanks very much .. for the great time you gave us!! My wife and I came to attend a wedding and spent a very pleasent two days at this lovely villa. Frankly, we did not expect this level of quality in Allahabad. The rooms were tastefully done and the atmoshere very relaxing. The hosts Ivan and Purnima make you feel right at home in this highly recommended home stay. If there was one thing that made the summer heat,city pollution and chaotic traffic worth it,was our stay at this cosy and exquisitely done up place,& the place comes alive by the delightful people who run this villa.From the hosts to the the staff to the guests you may come across while your stay here, everything will add to your trip to Allahabad by just choosing to stay at the Kanchan Villa. It is most conveniently located from the railway station(10-15 mins by car),& the hosts are extremely helpful, cooperative and efficient at coordinating with the arrival and pick up from the station. They are this fun loving couple who are 10/10at hospitality, have so many interesting stories to tell and if you are carrying a music instrument, then you can expect a delightful jam session in the evening as well. They will also assist you with anything in the city. The rooms are limited so planning in advance will be recommended. Each room (much to my excitement) has plenty of books from different genres, clean, well maintained & complete with a tea n coffee maker. The food, veg and non veg is scrumptious. Full marks so Totally recommended. Kanchan Villa is a charming out of time place. The welcoming by the owners were just fantastic. This is a lovely property, the garden is luxuriant, the rooms are all different with a lot of charm. Many places to sit out side and enjoy the tranquility, the birds singing. This is so nice after the bustling tour in the city. The food was excellent, we had a great evening listening to live guitar and singing by the owner who loved Country music! It is a beautiful place to stay, service is great. Everyone has been very helpful. I stayed in this hotel in October 2014 along with my full family. The service of this hotel is really good. We really enjoyed every bit of our stay. It is like a home away from home. I am happy that I found this hotel after extensive searching in google. Very good home stay. Rooms are comfortable (spacious and with a much appreciated hot shower) and clean as the rest of the premises, that are hidden in a lush green garden taking away the pressure of the overpopulated and constantly busy Allahabad. The hosts are superb. They did everything possible to help me out with my requests at all times. They have a car and a driver that can take you around when needed and this is very practical. An amazing place right in the middle of nowhere. Better than any 5 star property ! Run by a very welcoming couple who take a personal interest in your stay, I was looked after from the start to the end of my stay. I felt at home instantly for it was like staying with family. I could not have asked for a better stay. To stay at Kanchan Villa is a romantic experience. I was there with my wife on a road trip from Delhi to Aurangabad, Bihar. Poornima ji, the owner of the place is a nice host and she called us several times to ascertain that we were on the right path. And we found her waiting when we arrived quite late in the evening. The property from the early 20th century is well kept and maintained. We were lodged in the Bengal Room of which we had heard a lot on TA and true to the admirations, it was in deed a lovely room with all comforts attached. The room has original floors from the last century and the furniture too are from the same era. The Living Room and the Dinning Hall are quite adorable. Having said that I must add that we encountered a foul odour as we entered the house that can be easily checked with some incense stick or the likes. This would appear more welcoming too. I had the notion that the food here is expensive, but it is exorbitantly expensive this we could not imagine. We did have some good homely food freshly prepared, but at Rs 325 per head, the price was definitely more than its value. You expect a much more better food for this price. Moreover, we were charged the same amount for my helper's meal, but the Rotis and the Sweets were missing from his Thali. You don't charge the full amount for half the service, do you? This was the best find of our trip to Allahabad. Situated in Lukerganj, which is 6 mins from the railway station, the villa is located in a residential part of the city. Kanchan villa is a B&B place but the service, food, cleanliness and warmth of the owners will leave any star rated hotel behind by miles. Named after the host's (Purnima) grandmother, the century old bungalow is Imperial India's charming legacy.The rooms are divided on the ground and first floors and each room has it's unique theme. We were thrilled to be in the Bengal Room which had the old world Calcutta charm so beautifully captured. Ivan and Purnima are extremely caring hosts and are always ready to help out with cars, sight seeing options and many stories. One has to mention the cook who made outstanding food every morning for breakfast. They have a 15% off season discount till 30th June when booked from their website. When in the city of the Nehru's, stay HERE! Stay in this hotel was really very comfortable. Its a well maintained hotel good to stay for everyone. I really got a good stay. We had a wonderful stay at kanchan villa, the Hosts Ivan and Purnima were excellent. Loved the way the rooms were decorated and maintained. The attendants serve with a smile. Food was good... They are quite helpful and welcoming, appreciated their eye for details. The place is beautiful. Very artistically done.kanchanvilla stands for the old world charm and modern amenities. Impeccable hospitality and affable hosts. I loved the ambiance and the surroundings. Allahabad turned out to b a surprise package.Overall a memorable stay. Keep up the good work. Allahabad needs that. The location is a little difficult. The drains along the road leading to the Villa are stinking. It was pointed out to the owners who expressed dismay at inaction of the authorities in spite of regular follow up. Both the hosts are very nice. They made us feel at home. We loved staying here so much that we overstayed and rescheduled our trip. Once we even made a deliberate stop-over at Allahabad just to visit them. Mr and Mrs Lamech are wonderful hosts and have kept the house tastefully. Yummy home cooked food (both vegetarian and non-vegetarian) and they even ask what you would like to have. The house is ideal for a cozy trip during the winters.The staff is very friendly too. 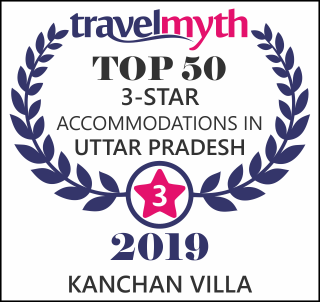 The reviews put us off staying in Allahabad hotels, so we looked into b&bs and found the wonderful Kanchan Villa where we spent five happy days in a large suite with our own entrance, a lovely flower covered patio and the use of a family kitchen adjacent to our sitting room. The other rooms in this huge beautifully restored family bungalow looked lovely and were large. We were able to be as independent as we wished, but chose to eat all our meals here family style...and we were able to ask for our favourite foods each day. As we love Indian food, we were also able to try lots of new foods suggested by Purnima, the owner and our hostess. Needless to say, the food was outstanding and there was plenty of it. Kanchan Villa is an 'establishment' with several vehicles and drivers and guides available. We were grateful for the opportunity to use the transport facilities available (at a reasonable cost) and for the help we were given in finding places we wanted to visit. The rooms themselves are beautifully done with quality fittings and luxury bathrooms. Everything is immaculately clean and superbly maintained. It was rather like staying in a 4/5 star b&b at a very reasonable cost. The house is well located for touring Allahabad and is in a very safe upmarket area. You can walk to the nearest main road in five minutes and pick up a rickshaw to get around if you want to or you can buy fruit and provisions from the stalls and small shops in the road. We were looked after very well by the staff and by Purnima. We would certainly recommend Kanchan Villa to other visitors without any reservation. I recently spent two nights at this Homestay in Allahabad and it was a most memorable and satisfying experience.First of all,I was met at the train station by a very nice man who was actually waiting just outside my railway carriage when I arrived.He drove me by 'rickshaw to the Guesthouse straightaway.There I met Purnima-a charming and lovely person-who made me feel at home rightaway.I was hungry when I arrived but that wasn't a problem as I was provided with lunch by Purnima.My room was superb-large,tastefully furnished and very comfortable.Some of the furnishings were antique-I slept in a bed for example that had belonged to Purnima's grandmother.I noticed that the rooms had names not numbers.Purnima explained that this was her policy,making each guest feel special.I slept in the Bengal Room-fabulous!Purnima provides the guests with gorgeous home-cooked food-both vegetarian and non-vegetarian.I had lunch there the first day and dinner on both evenings-inexpensive and just beautiful.Purnima also arranged a train ticket for me from Varanasi to New Delhi as well as organising a 'rickshaw driver for the two days that I spent in Allahabad.....This was a beautiful experience-a fabulous Homestay run by a very kind lady who has a gorgeous home and who just loves helping people....very highly recommended. We stayed at Kanchan Villa a year ago. It was a wonderful experience. The hosts, Ivan and family made our stay very comfortable and were very hospitable. Although it has been a year, the memories of our stay are fresh. Thanks Ivan. Four of us ( two couples) stayed here in January 2016. Our hosts were charming, engaging, hospitable and our food and lodgings exemplary. The rooms were en suite, very comfortable and afforded great comfort. I have to mention the home-cooked meals which were some of the best we tried in India. We were ably assisted in our explorations by Ivan and his family and we are very grateful for this and for the use of their vehicle and excellent driver. Thank you Kanchan Villas - truly a home away from home. I stayed at Kanchan Villa with my husband in the August 2015 for three days and the trip was beyond our expectations primarily because of the Lamechs. Purnima and Ivan Lamech were the perfect hosts - warm, charming and incredibly hospitable. They ensured that every thing we needed was taken care of - without needing to ask for anything. One of the highlights of our stay was the time we were able to spend with them because they treated us like family and made us feel very welcome. The food at Kanchan Villa is superb. Each meal is well-thought out and balanced. Breakfast was my favourite meal because either Ivan or Purnima usually joined us and it was like eating breakfast at home. Purnima is a wonderful, wonderful cook and her pork vindaloo is a thing of legends - as is the mutton curry at Kanchan Villa! As were the idlis. And the vadas. And the rest of the food! We stayed in the Kanchan Villa suite, a wonderful room with the most beautiful four poster bed and a fantastic bathroom. It had its own sitting room where I spent quite a while reading. I would recommend this room because not only is it connected to the rest of the house but it also affords you privacy which is great if you are newly married like I was! The cleanliness at Kanchan Villa is of the highest standard - be it the room we stayed in or the common areas like the living and dining rooms. The bedroom was tidied up and the bathroom cleaned and replenished very regularly while we were there. The living room is a very inviting place with an assortment of sofas (and its GORGEOUS colonial furniture) to curl up in which you are reading or idly chatting the afternoon away. If you are going to Allahabad and are looking for a home away from home, look no further than Kanchan Villa and the warm hospitality and charm of Ivan and Purnima Lamech. We will be back soon enough! Ivan and Purnima were great hosts, made us feel part of the family and advised us of the best ways to see the sights of Allahabad. The use of their car and driver was fantastic, and enabled us to see a lot of Allahabad easily and stress-free! The food they provided was some of the best we had in India, and they made sure that it included local specialities. The accommodation was lovely - all in all a great place to stay!! I'd highly recommend staying there to get the most out of your stay in Allahabad. Firstly, kindly accept my sincere apologies for such a late review regarding my comfortable stay at your Villa. Secondly I would like to thank you for being such a wonderful host for us. My stay at this villa was so good that I will always cherish that. The room was well decorated and had it's own beauty and aura. The staff was very supportive and took care of all our requirements and needs during our stay. The food served was very tasty and we thoroughly enjoyed the candid chat with the host over dining table. We could feel the warmth, love and support of the beautiful couple and they were more of a friend than being the owner. I sincerely recommend everyone visiting Allahabad to stay at Kanchan Villa for experiencing hospitality beyond expectations. It was a casual visit regarding some work Stunned after entering the welcome room(not like reception) had a long chat with ivan ji and mam they were found as I had heard long before about them. The best part was that after being a businessman each and every thing was handled personally by owner. Now as I am aware of place (little help from google) Very nice feeling, i hope to stay there once in a lifetime coz living in Allahabad and not visited kanchan villa will be like half Allahabad. We had come down from Kolkata to attend a ring ceremony and our arrangements for staying we're made here The minute we entered the villa could feel the love ,passion and the style the owner has . Every thing was just perfect. Not based on modern furniture but old rich British concept has been given which gives a spark Overall a memorable stay. Keep up the good work. Allahabad needs that. The place is beautiful. Very artistically done.kanchanvilla stands for the old world charm and modern amenities. Impeccable hospitality and affable hosts. I loved the ambience and the surroundings. Allahabad turned out to b a surprise package. Ivan is a wonderful person. I recommend this place for all travellers. From the start I felt very welcome. Our hosts, Pixie and Ivan, do really know how to make you feel at home. Kanchan Villa is very comfortable, full of charm, very clean, and very cosy. I have been spending my holidays India for some years now and my stay at Kanchan Villa is without a doubt one the best places I've experienced. The home cooked meals are super tasty. The staff is very friendly. The wifi works also very well (which is not always the case). Room Tip: I stayed in the Bengal room, nice room with attached bathroom. Trip was excellent and stay was good, comfortable and feel like home. Very cooperative and professional staff in their duties. Room area was good N feel safe like home, Terrace area outside the room good for evening tea break. Let me start by saying that I dont write a lot of reviews, and I often take the reviews that I read with a grain of salt. But for this place, all of the positive reviews are absolutely true, and even understated. Ivan and Pixie are just the warmest, sincerest, and kindest hosts you will ever find. Guests are treated more like family than guests. There is no need to go out for food - breakfast, lunch, and dinner are better than anything you will find in a restaurant. The hosts sit and schmooze with you over drinks before dinner, and then dinner is "family style" with the hosts and other guests, leading to fascinating and stimulating conversations, and new friendships. I am usually not a B&B type of person, since we like our privacy, but this place struck the perfect balance between privacy and togetherness. The place itself is lovely, beautifully and tastefully decorated with antiques and artwork, and is perfectly maintained - everything works, and theres not a spot of dirt, decay, or other blemish anywhere. The staff is great, from the drivers to the cooks, and seem to genuinely enjoy their work hosting guests. Pricing for everything is totally fair, from meals to journeys. Ivan and Pixie are wonderful, warm, loving people, and they will make sure your stay in Allahabad is perfect. From the moment we arrived with their driver waiting for us at the train coach, to the moment we left, everything was arranged to make sure we were taken care of. The room was big and comfortable, immaculate bathroom with 24/7 hot water. Honestly, its worth a trip to Allahabad just to stay at Kanchan Villa and get to know Ivan and Pixie, but do go to the Sangam, too! If you think Ive exaggerated, read my other reviews, and youll see that I tell it like it is. Room Tip: Didnt see the other rooms, but my wife did. She said the upstairs rooms are nice with verandas. First visit to Alahabad for work was not exciting for me, cause I didnt get any formal hotel booking at that time. But one of my colleague suggested me to book my stay in Kanchan Villa. Till I reached in that facility, was not sure about the surprises. The owner welcomed us at the front gate of the facility, interesting! Its a home stay, but it was wow effect for me when I entered into their common space. We stayed their for 3-4 nights, every moments I enjoyed to the fullest. We had our meals over there, one of the best arrangements that I have experienced in India. Morning breakfast in a semi-open terrace, good food, with the owner family accompanying their guests, and their offer to make available all mouth-watering special cuisines from all special places of the city - everything was just amazing. Rooms were nicely maintained and organized, staffs were friendly, location was fantastic for us to enjoy traditional weddings, etc. If I get another chance, surely will visit this place again and of course with the family. I am also sharing 2 youtube clips to show how the owner mix with their guests to make their stay a real pleasure. They were very helpful and we were very happy with the amenities and the staff. They went out of their way in assisting us with various things.It was clean and spacious and had all the facilities that you will normally expect from a good place. Its a place where everything was totally awesome and relaxing ... the owner couple of this place is really worth meeting they are full of life and positive energy. I organized my engagement here and the place was best for in-house photos , rooms were just clean and tidy as if you feel you are at your home itself, worth visiting here on every trip to celebrate the engagement over and over again. We never felt that we are far away from home. It was a wonderful and unimaginable experience for us. Neat accommodation and tasty food suiting every requirements. We had a beautiful experience at kanchan villa . Neat clean and done tastefully the owners took care of us and made us very comfortable. We felt that they enjoyed our company and stay as much as we did. Well travelled and well read couple we found good friends in them. True value for money,nothing was overcharged. We came back rejuvenated and relaxed and hope to visit them again. Created over a large bungalow built in colonial days, Kanchan Villa offers old English style, yet modern living. It has 7-8 rooms. All of them developed extremely tastefully. The wooden furniture is used in most places. The massive blocks of bathrooms redefines luxury. Outside the rooms, you can find thicket of trees and creepers that lets you forget that you are in the city of Allahbad. The drawing room and dining room is perhaps the best part of the bungalow. The luxury of old colonial bungalow is everywhere; and yet the comfort and convenience of twenty first century can be experienced. But hang on... This place is not just about house, the rooms, the furniture. It is the host and hostess - uncle Ivan and Aunt Purnima - that make the difference. They are extremely warm, helpful and enthusiastic. The moment you enter the house, they make you comfortable. You can have delightful conversation with them about the local culture, the place and many more topics. Both of them take efforts to maintain the house and the standard of the place - not an easy thing to do. Thank you Purnima and Ivan for giving us a great experience. Overall, the place offers almost everything to everyone! I was with my parents and family. I just loved the place. So did my 9 yr old daughter. And my 75 yr old parents! Staying at Ivan Uncle and Purnima Auntys home stay was just like being at home. From fresh, homemade, vegetarian meals to the ins and outs of Allahabad and some very friendly banter, our stay at Kanchan Villa was undoubtedly memorable. The proximity to Khusro Bagh and the train station is fantastic, as a grad student researching that particular monument the location was unbeatable. Moreover, my hosts offered to drop me on more than one occasion! The staff is very friendly and accommodating, and it never feels like people are constantly around you. One can sit back and read, walk around the neighbourhood, head out to Civil Lines, and never feel pressured! The best thing about our stay, though, were the meals, we had a chance to get to know Uncle & Aunty, talk about Allahabad, about our travels, about family, what have you, which is really like dinner table conversation amongst family members. I highly recommend staying at Kanchan Villa if youre in Allahabad, because I certainly will be staying here again. Room Tip: The hosts are very accommodating, theyll give you the best tips! Visited Allahabad with my parents and we were very pleasantly surprised with the superb hospitality extended at the Kanchan Villa there. The property is a rare and unique combination of modernity, traditon and antiquity - very meticulously preseverd and showcased; must be by a cultured and artistic mind to speak the least; all seems to be in the lap of mother Nature. The sofas, the dining table, the piano and above all the building itself is understood to be more than 100 years old and that we had the impression of very carefully being taken to the later nineteenth or the early twentieth century through the very comfortable stay at the Villa. Although, the owners were understood to be away in a short sojourn to the US, the entire staff there, were trying their best to make our stay both comfortable and enjoyable. As the Howrah - New Delhi Rajdhani Express, we had travelled Allahabad to, arrives Allahabad Jn. railway station early in the morning, they even arranged a pick up for us from the station at 3:30 AM. The food served was very good and prepared as per our requirements. The location is good and in a posh residential area not far from the city centre and hence free from the hussle and bussle of the market places or the main city area. Moreover, they provided us a SUV, that is, a Mahindra Xylo car at a resonable rate for our necessary visits in the city including the Sangam. The domestic helps, namely Urmila, Kiran (both ladies) and Hemraj are very well mannered and they treated my parents as their own. They have named the rooms as Bangal room, Green room, Cane room, etc. as per the artistic taste and flavour added to the rooms. Our room was called Apartment as it was a twin bedroom with a common entrance and with a big attached bath. Every room fetures a lot of books - mainly in English, paintings and objects of art and craft. However, I would like to suggest the owners of the Villa to introduce card payment and free wi-fi as soon as possible. I would also like to very humbly suggest to name the new room coming up infront of the Apartment as the ASSAM ROOM - adding therein the artistic flavour of the Indian state of Assam. I have no hesitation to higly recommend staty in Kanchan Villa in Allahabad. nestled amidst gulmohar trees in full bloom, birds chirping and clean fresh air..my desire to pray for my dear departed was fulfilled. Pixie is now a friend, was a wonderful host, her staff are caring and attentive. my trip to the sangam was smooth, the evenings over drinks and dinner with Pixie, who ensured I was confortable, the conversations made me feel like ive known her for a lifetime. I am off to varanasi today and I take with me the love and memories of kanchan villa. I whole heartedly recommend it to all those who are looking for a homestay in Allahabad, full marks. We had been driving from Delhi and decided to pull off the highway into Allahabad on a whim to get the kids some Mcdonalds. Besides the entrance to Allahabad through those market roads being a nightmare, it was a nice break. We decided to get on to cleartrip.com and see what was available as far as hotels and we stumbled upon Kanchan Villa, on their debut day on cleartrip! About 20 minutes after making our reservation we showed up at their door! The hosts were so accomodating to our group. Kanchan Villa is a surprise oasis in Allahabad. The hosts treat you like family. The rooms were spacious and comfortable and the living room downstairs refreshingly in a/c. We highly recommend this place. The price was just right too! The only negative side-effect of sharing how excellent this place is, might be that it could be to crowded next time. No kidding. All sky-high above average. Outstanding owners, KITCHEN, staff, cleanliness. Next time in Allahabad: Kanchan Villa. I was in Allahabad for a business assignment for 15 days and my wife was to join me there. It was important that the accommodation we had was safe, spacious, clean and comfortable. Kanchan Villa is all of this and more. Its a bungalow with large spacious bedrooms, well appointed lounge and dining hall. Ivan & Purnima are a lovely couple and very warm hosts. They are well traveled and strike interesting conversation. Ivan has a great sense of humor and Purnima is intelligent, caring and friendly. The staff they have is also helpful. We thoroughly enjoyed our stay at Kanchan Villa and would highly recommend their place if you are looking for a home-stay kind of a place. If you ever visit Allahabad ( India ) the Holy city for any of your need, I suggest Kanchan Villa, 64 Lukerganj is the best place to stay not only because of its location but also the peaceful, serene and welcoming atmosphere,contributed by the B&B Owner, they are so co-operative ,affectionate and caring, makes you feel at home away from home, nice and pleasant lounge to sit and enjoy music in the evening with a complimentary glass of wine (Optional) breakfast of your choice and friendly staff. I am all for it next time if I happen to visit Allahabad Sangam again. Room Tip: All rooms are good depends on your personal Choice. I stayed at Kanchan Villa for a few nights earlier this year. A quick and easy pick up from the airport and a lovely welcome when I arrived. The place has a family feel with large, clean rooms and homely touches. What impressed me most however was the host, Purnima (her husband was away on business) whose knowledge of Allahabad and conviviality made my work a great deal easier. Food was simple and excellent and the selections of whiskey was a lovely touch. I d thoroughly recommend Kanchan to anyone and the fact that they attract long term guests testify to the their hospitality. A pleasure. The rooms are all large, airy and unique, each with their own flavour and feel. The food served is excellent. The guest house in general is clean and well managed. But what makes Kanchan Villa a truly unique experience are the hosts, Ivan & Pixie; friendly and welcoming, a fountain of good stories on India, UP and Allahabad in particular, great humour and insight, excellent company. You won t regret! .Kanchan Villa is a beautiful home and is immaculate.Guest bedrooms are comfy and have lots of lovely finnishing touches. Nothing is too much trouble for Pixie and Ivan and meals are delicious home cooked and served at the family dining table. (Beware, They force you to eat lots!) They are very helpful with travel plans and information. Before dinner guests are invited to sit round the fire and chat over drinks, which is lovely. On my last day Pixie made me a packed lunch for my train journey, there was enough to feed an army! I would have liked to stay with Ivan and Pixie for longer, but will definately be back! Room Tip: All the guest rooms are lovely. My husband and I moved to Kanchan Villa after spending a night in another terrible hotel. It was such a welcome relief to be in such a clean, wel-run homestay! Ivan and Pixie are lovely hosts, very pleasant to converse with. And our room was the nicest one we found in our stays at comparable places. I would highly recommend staying here, simple as that. We arrived early in the morning on an overnight train and tried to find a hotel to stay. We couldn t find anything suitable and rang Kanchan Villa. This was the best thing we could have done! A car was sent to collect us and we arrived to a warm welcome and a beautiful bedroom and bathroom. Pixie and Ivan were wonderful hosts and we enjoyed our mealtimes with them and loved the delicious Indian food. One of our reasons for going to Allahabad was to visit the Cathedral where James s grandfather had been in the 1890s. This too was a very special experience and we were made most welcome. We have very happy memories of our whole stay in Allahabad. We ordered the last room, night before our stay. The hotel is on Google maps data base so navigation was a breeze. When we arrived we were welcomed by lovely couple that runs this fine establishment. We were taken to the living room of the villa for welcome drink and quick introduction. After we refreshed in our beautiful room we returned to the living room for mingling function with owners and other guests. Homemade delicious Indian cuisine dinner was served shortly. After dinner owners took us for a “spin” in Allahabad to show us the town. We were very fortunate to stumble upon Kanchan Villa. We are from the UK and tried to book a hotel in Allahabad which proved to be very difficult. I would suggest to people visiting Allahabad to forget the hotels; stay at this Villa instead. The hosts (Purnima and Ivan) are such lovely and friendly people who could not be more hospitable and friendly. We were going to Allahabad to perform the Asthi-Visarjan ceremony. Purnima was so helpful in arranging everything before we even got to Allahabad. Without her help I would struggled to get the ceremony arranged within our timescales. Aside from Purnima and Ivan, a special mention must go to the members of staff, especially the lady who does the cooking. Fantastic food and such variety. As an example of the hosts' hospitality, it is worth mentioning that we went to the airport to get our flight to Delhi only to find that the flight was delayed by 3 hours. Purnima arranged for the her driver to come back to the airport to pick us up. We got back to the Villa only to find that a lovely lunch has been prepared for us! You just can beat this level of hospitality and kindness. This is a jewel in Allahabad's crown. I highly recommended it. Ivan - I miss your pre-dinner drinks! As an example of the hosts hospitality, it is worth mentioning that we went to the airport to get our flight to Delhi only to find that the flight was delayed by 3 hours. Purnima arranged for the her driver to come back to the airport to pick us up. We got back to the Villa only to find that a lovely lunch has been prepared for us! You just can beat this level of hospitality and kindness. This is a jewel in Allahabas crown. I highly recommended it. After arriving in Allahabad late at night and staying in a terrible hotel we found Kanchan Villa! So far it has been the high light of our trip! We were welcomed by the owners Ivan and Purnima with a breakfast and they organised every thing for us including tours, further accommodation and train transfers. We ate dinner with them and heard Ivans storys over a rum in his bar. Our only regret is that we were only able to stay one night. Defiantly a must if you are visiting Allahabad! Rooms are comfortable (spacious and with a much appreciated hot shower) and clean as the rest of the premises, that are hidden in a lush green garden taking away the pressure of the overpopulated and constantly busy Allahabad. The hosts are superb. They did everything possible to help me out with my requests at all times. They have a car and a driver that can take you around when needed and this is very practical. We spent 5 wonderful days during Durga Puja (Durga Puja is held in a park next to the vila which is 107 years old) with extended family in the Vila with Ivan and Purnima (is Bengali), the most hospitable, versatile, friendly hosts you could ever wish to meet, who went out of there way to make our stay a most memorable one. The house is an old (perhaps built in 1932) villa from the colonial days and has very tasteful ethnic furniture (rarely seen these days). The rooms (AC) are very comfortable, spacious and extremely clean, especially room on ground floor (the Bengal Room). Also the location of the villa being in a quiet area of town makes it very relaxing. Conveniently located close to the station and they will provide transport upon request to and from the station and anywhere within the town at a reasonable rate which makes life and getting around a lot easier. Excellent food is served by friendly young staff personally supervised by Purnima. Last but not the least the hosts are having 3 friendly dogs. Every bit of it made our visit to Allahabad all the more enjoyable from October 9 to 13, 2013. Room Tip: All the Rooms are very good ! We had gone to Allahabad for my father's Asthi Visharjan and had a very pleasant stay at Kanchan Villa. There is not much space around the building, but the residence is very well maintained. The decor gave me an old world British Colonial feel, which was great. The owners of the villa - Ivan and Purnima are excellent hosts. You get the feeling as if you are a guest in a relative's home which is very relaxing and very welcoming. They are genuinely good people, who enjoy sitting and talking with their guests. I felt that the food was just excellent. Very well suited to our tastes. Homemade achars and pappads added special flavor to each meal. The kitchen personnel went out of their way in making our stay pleasant and met all our requirements with a smile. Kanchan Villa provides transportation (at a fee) for any trips one may want to do during their stay. We went to the banks of Ganga for the rituals and the driver was helpful with local information as well. We learnt that Kanchan Villa is also a great place for visitors who want to experience the Kumbh Mela. Never said 'home away from home' before this, but this is how you will feel like here. We booked the place at the last minute, for the last days of the Khumb Mela, when you have litteraly millions of people fleeding to Allahabad. We were told by the owners, Ivan and Purinma, that unfortunately no room at Kanchan's was available, but they could accomodate us in another similar place. Once in Allahabad early in the morning, we were offered at Kanchan's a room to rest a bit and refresh ourselves, then we were served a good Indian and Continental breakfast and, relieved and fed, we were given a transport to reach this 'other place'. The other villa was Purnima's auntie's, a retired professor whose hospitality and kindness we enjoyed a lot. Ivan and Purnima organized for us and other guests a BBQ at Kanchan Villa and they also arranged the transfer and boat trip to the Mela for the next day. We really enjoyed very much the hospitality and the family environment in both places, as well as the way Ivan and Purima have organized everything for us. Rooms are very clean, service impeccable, home made food just great, hospitality will make you feel home. We had an amazing experience in Allahabad and the main reason being a really beautiful and clean place to stay. Kanchan Villa can be compared to any 3-4 star boutique hotels. The rooms are done beautifully and is super clean. They serve you food if u are interested and its good healthy homemade food which you will nit find in hotels. I would highly recommend it to everyone traveling to Allahabad. I & some friends stayed for about 12 nights during the busiest time - the Kumba Mela. Purnima & Ivan are the most gracious & sincere hosts catering to our every need. Our special vegetarian food requirements were deliciously met, our need for meditation or quiet times in our rooms were automatically accepted & catered for, economical transport was smoothly organized to the Ganges River & Arial Ghat during periods of extremely heavy traffic. When we had trouble getting back at night Purnima & Ivan went out of their way to make sure everything went smoothly. For those that don't speak Hindi English is mainly spoken by the managers so there's no language problems for overseas visitors. In short we were treated like special guests in one way & like members of the family in another way! Kanchan Villa has a good "vastu" orientation with the street & front door entrances facing east. It also has big en-suit bathrooms & nice antique type furniture in Bengal Room I stayed in. Room Tip: Flat at the back is very quiet & out of the way. Bengal room is next to the sitting room lounge. I am a marketing personnel & I travel quite often. I was touring around Uttar Pradesh & I was kind of bored staying in hotels so before I arrived at Allahabad, I tried to find out some other options. I was fortunate enough as I googled ‘Homestay in Allahabad’ & ‘Kanchan Villa’ popped up on the very first place. The day I visited this place, uncle & aunty was not keeping well though they made sure I was well taken care of. I would like to appreciate wonderful stay, beautiful house, delicious food & warm hospitality. Friends, you can expect lots of love & care in this villa. Thank you for welcoming me & sharing your beautiful and comfy abode. It made my visit to Allahabad more memorable. Many thanks to you & your staff for impeccable hospitality, your place is such a wonderful and majestic place to stay, recharge, relax and reborn again. Wish could stay longer and experience much more. I also found the standard of service and hospitality to be very high, high to the point where it sets quite a benchmark for other places to live up to. Food was awesome as well. Lots of nice little details in the set up of the room made the experience all the more special. I hope to get back here very soon. PS: Next time I would like to listen songs from Ivan uncle & watch Purnima aunty’s photographs’ collection. Room Tip: they'll mk sure tat u r in d best room available.. I stayed in Kanchan Villa with my and cousin's family this October (2013) during Durga Puja in Allahabad. I don't think any other place could be better than this in Allahabad. Our hosts, Ivan and Purnima are the warmest, most friendly and caring hosts one can ever imagine (even this is less to describe them). I am a person above 60 years and have a medical condition, which was explained to Purnima. After that she took care of my food and diet as if it was my second home. The villa is an old heritage building, which is very well maintained. The rooms are spacious, very comfortable, tastefully set up and very cleanly maintained (all rooms are A/C). They have a full power back up which takes care of power outage which is a common thing under present SP Govt. The villa is located is quiet locality which insulate the resident from noise and afford relaxing environment. The staff is amazing and always keen to render quality and sincere service. Purnima, keeps a keen eye on food that is served and the cook has wonderful talent to make real delicious and tasty food. Some of the preparation I will remember through out. Any and all help were forth coming even before we could complete. I can't think of any such memorable stay elsewhere. In Allahabad, this is the place to stay. Hospitality is redefined by them. If I come to Allahabad again I will stay here only. Ivan and Purnima, our most sincere gratitude and thanks for making most memorable stay. how we miss your love and company. having stayed with you all for the better part of five months, it is hard to put into words the feeling of having a whole new family as you guys have become for us. there were nine, sometimes a dozen of us renting your amazing digs. you and your beautiful staff treated us to a world that we never would have experienced if we hadn't fortuitously stumbled upon your oasis. our four kids enjoyed the calm in the middle of the storm that kanchan villa offers. through your patience and love they will forever think of india and especially allahabad as a magic place. we, of course, are looking forward to the day you stumble into australia , to offer you the same kind hospitality and rekindle our family ties. Dear Ivan and Purnima Sorry it has taken so long to contact you but we had no Internet in the jungle lodge. We are now sitting in Dubai airport waiting for our plane home to Birmingham but we just wanted to say a huge thank you for all the help and assistance you gave us. It was all so much more than we expected and just goes to prove what wonderful people there are in India we can only hope that the British give our visitors so much time during their visits. we cannot speak highly enough of kanchan villa! Pixie and Ivan are the hosts from heaven! We have just spent 3 wonderful days with Ivan and Purnima, the most hospitable, friendly hosts you could ever wish to meet, who went out of there way to make our stay a most memorable one. The rooms are very comfortable, spacious and extremely clean, also being in a quiet area of town makes it very relaxing. Conveniently located close to the station and they will provide transport upon request to and from the station and anywhere within the town at a reasonable rate which makes life and getting around a lot easier. The food is good served by friendly staff. All in all made our visit to Allahabad all the more enjoyable. Kanchan Villa is a delightful homestay. Pixie and Ivan Lamech are the warmest, friendliest and most caring hosts one could wish for. They are full of fascinating stories, so do make time to hang out with them. They will help you figure out travel, laundry, shopping, and any other concerns you may have. And they speak English (this is an issue with most places in Allahabad)! The rooms are comfortable and pretty, and a treat for antique lovers. The food is delicious, wholesome, home cooked fare. There's plenty of greenery all around, some lovely sit-outs, squirrels running up trees and playful dogs. The guests are an interesting, cosmopolitan mix - we bumped into people from Nepal and Australia. I stayed here with my husband during the Kumbh and loved it! We had the self contained apartment to ourselves. It is totally private and has it's own terrace. I don't think I'll ever want to stay anywhere else when I'm in Allahabad. If you are heading to Allahabad, you wouldn't find a better place to stay - private, comfortable, spacious, central and the fact that the hosts are always there to help. Pixie, Ivan and the staff as well were extremely helpful and warm. Loved chatting with them over dinner. We planned to stay for a couple of days and ended up staying five! Pixie and Ivan are lovely people, the service is the best, the workers are amazing and the rooms are lovely. Honestly, this is the first review I write and I'm doing so from the bottom of my heart. These people are lovely and generous and humble, the best stay if you're in Allahabad, no doubt. On a recent visit to India from Melbourne and taking in the sights Allahabad had to offer, and not wanting to stay in a hotel, I came across Kanchan Villa as a place to stay thanks to my taxi driver. Having stayed in a few hotels in some of the other cities during my travels, I found this home style abode a refreshing change from the hustle and bustle which goes with most Indian cities. Purnima and Ivan are a delightful couple who run this old style family home which provides all the basics a traveller would need in a clean and fresh enviroment. From the moment you step into the home, the warmth and friendliness which is extended to you, is one to be experienced. The room was well furnished, clean and had all the comfortable ammenities one would need. The hospitality extened to us by the family was one of genuine warmth and we felt honoured to be invited to join them in a family meal and get together. I will be returning to India for a visit again at the end of 2013 and look forward to spending some more time in Allahabad and continuing some of the interesting discussions we had with Purnima and Ivan on the various cultures and festivals celebrated in the country. Quaint, lush green with a strong feeling of being at home rather than having to stay in the sterilised environment of a hotel (especially in Allahabad, which doesnt have any decent 3-4 star hotels), this B&B run by a very warm and friendly couple is a better option than the some of hotels I personally checked out. The facilities are simple - very well maintained 2-3 rooms, TVs, hot water and staff that is happy to run around and perform smallish chores for you to make your stay comfortable. Ivan and Purnima sometimes join you in the evening for a drink and interesting conversation and if you are in luck Ivan might even sing some songs while playing his acoustic guitar to liven things up a bit. Room Tip: Ask for the Green Room, which has a green wall and lovely arabic tiling with a high antique bed.